Share it… – …STILL CRAZY AFTER ALL THESE YEARS! …at a supermarket here the other day and my girl was delighted as vermicelli is gluten-free so she would be able to eat that. They were selling at RM5.00 per packet and I decided to get the one with noodles as well to try. At that point in time, I thought they were products of Singapore because I noticed that “Singapore taste/Rasa Singapura” phrase. I was thinking that it was very cheap compared to the celebrated made-in-Singapore one which costs no less than RM10.00 A PACKET now and I truly am amazed that there is a supermarket here stocking up on those which obviously means that there is a market and there are people buying, even at that astronomical price. However, upon closer scrutiny, I found that they were made in Malaysia, Johore, to be exact. I don’t know why they see it fitting to share the limelight or credit or in Malay, tumpang glamor, when it is actually nyonya curry laksa which isn’t quite the same as the curry mee in the central and northern parts of the peninsula and Malacca/Melaka is as much a home to this peranakan culinary delight as Singapore even though I have not heard or read about any place there that is famous for it , only the one in Singapore which we had here and here before but both outlets have since closed down. 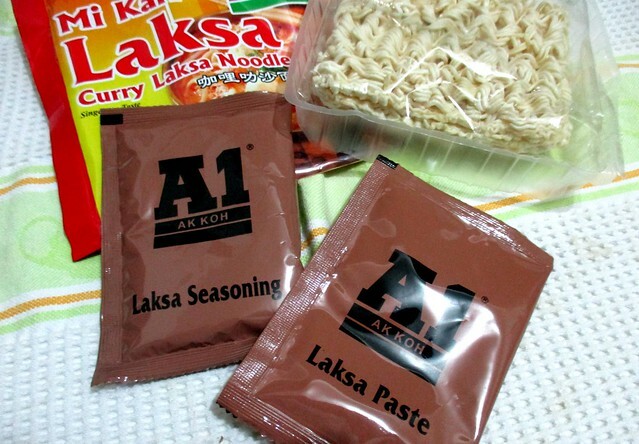 …and inside, there were two sachets, one with the laksa paste (sambal) and the other with the seasoning – it appeared to me like the santan (coconut milk) powder was in the latter sachet. – just like the nyonya curry laksa as I know it to be but considering that kampua mee is RM2.80-3.00 or less and a plate of Foochow fried noodles costs around RM4.00 and this is RM5.00 without the added ingredients and I would have to cook it myself, I certainly would think twice about buying it again. Of course, it would come in handy for my girl in her school in the jungle for times when she runs out of things to eat or when she does not feel like having much else…and of course, at less than SGD2.00 a packet, this would probably be a steal for Singaporeans coming over across the Causeway. 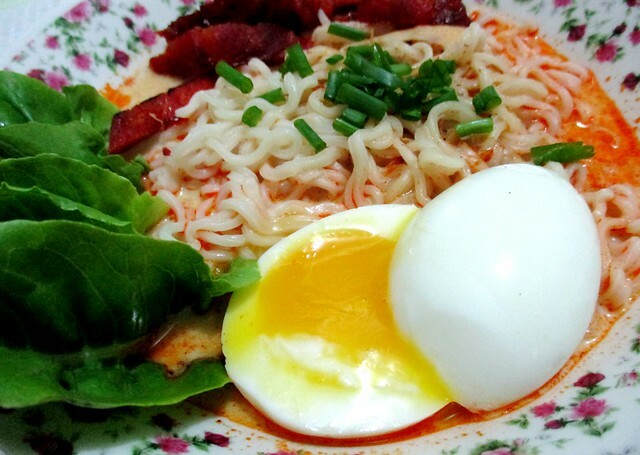 As always, the noodles you cooked looks so delicious due to the added ingredients. Yes, it is more convenient to just eat out but as you have pointed out, these noodles are suitable for Melissa when she wants a quick meal. …and cheaper too, eating out…just that one would need to go through the trouble of going out. Noodles as in the vermicelli, not those with wheat that are not gluten-free. Yes, there are a few brands with bihun but they are all not very nice, usually chicken flavour, clear soup and very very peppery. Considering the price, the work, the added ingredients, I would agree that it is better to have a bowl of nice laksa outside. 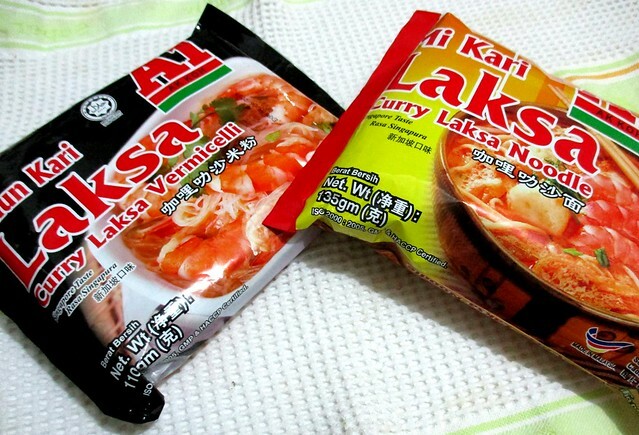 I have tried Lee Fah Sarawak laksa and I quite like it and they are not as expensive as this one. Yes, I think that’s RM8 something for a pack of 5 or 6, much cheaper. I think the mum did buy her a pack but I did not hear of her getting too excited about it. I guess it does not come near our favourites available at the shops here. 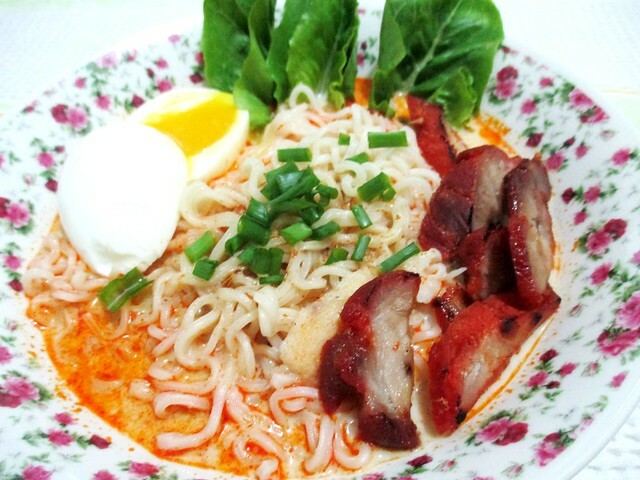 You are so good in making instant noodle looked delicious. I prefer to go out to eat. Haha. Looks good, eh? Hehehehehehe!!!! Pat on my back! LOL!!! LOL!!! No. 2, eh? 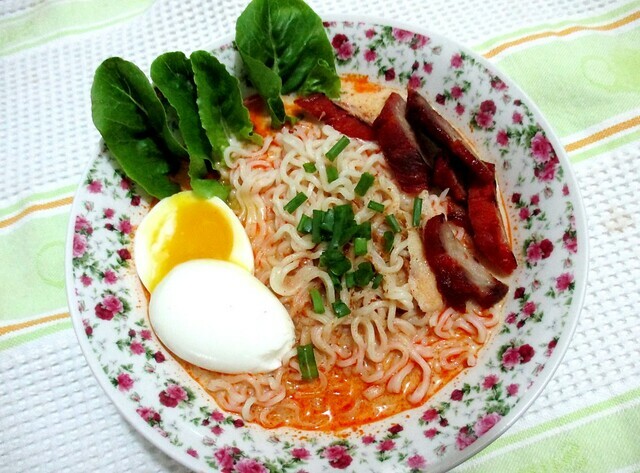 But I think that’s curry mee, not the nyonya curry laksa that I do prefer a lot more. You served it in such pretty bowls. It’s a free gift, most of my crockery came free with something – my other half can’t resist offers. LOL! Looks really good the way you plated it. And I love your runny center eggs!! That’s 5 minutes. around 7 minutes, the yolk will be hard but moist.